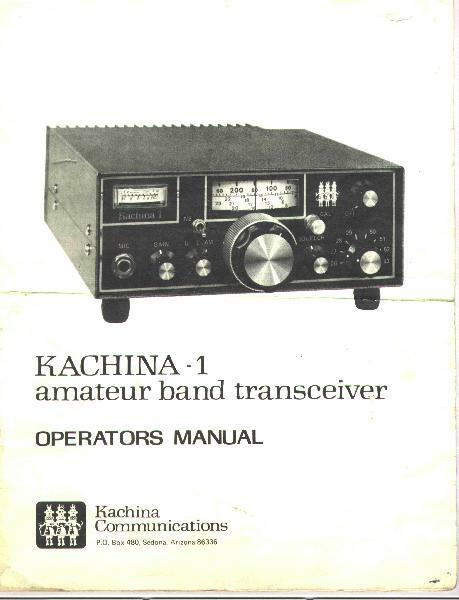 Here is my old Kachina 1, a 6 and 10 meter SSB mobile radio. Did you ever see or hear of one ? 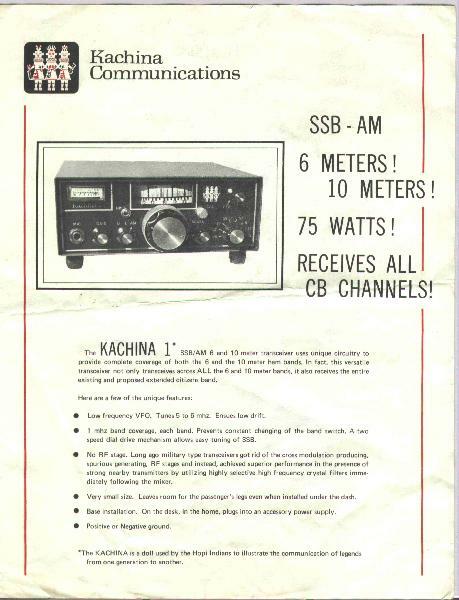 Kachina did not enter the Amateur Radio market with their 505DSP computer controlled transceiver in 1997. They actually made a radio in the late 1970's that was at the time a pretty interesting development. They utilized the latest technology that was at that time being developed for the military. It was a military contract that actually caused the company to back out of the amateur market place. 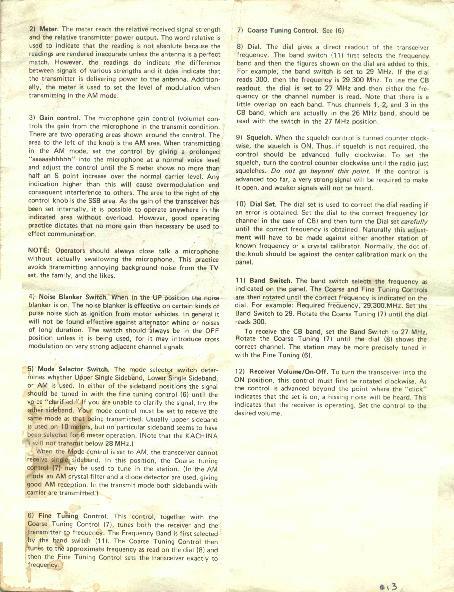 Below are copies of the original advertising slicks put out by the company. I have owned this radio since the late 1970's, it is a solid state, 150 watt input AM and SSB transceiver covering the entire 6 and 10 meter bands. It actually covers 25.9-30.1 and 49.9-54.1 in 1.0 Mhz band switch steps. Similar in appearance to the Atlas 210 of the same time period, this was the first ever amateur product made by Kachina. 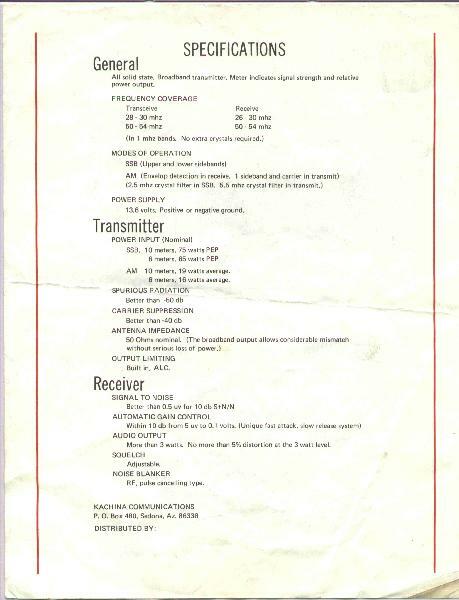 Below is the cover and first two pages of the operators manual. I shall be posting the entire oeprator and service manuals to library in the near future. 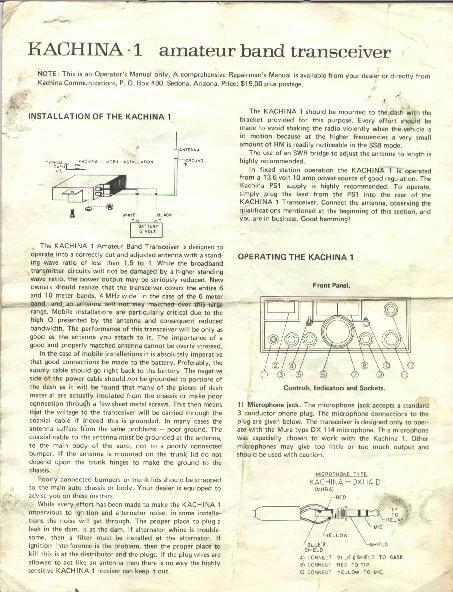 My Kachina 1 is one of only about 100 units built before the manufacturing rights were sold to the old Palomar Electronics in California that made CB radios, which went out of business, not related to the currnt Palomar. My unit has a very low serial number, and full documentation. 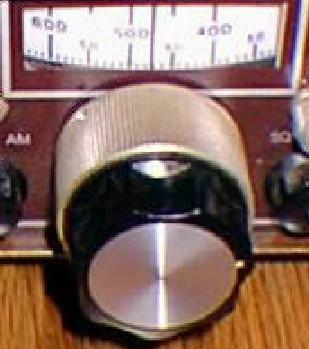 The VFO knob was very similar to the long standing concentric type used on many vacum tube radios like the Swan series that offered course tuning and fine tuning in frequency steps by virture of a center knob and outer ring. The VFO dial is a circular clear plastic drum that has a scale calibrated in 10 khz steps from 0 to 1000. 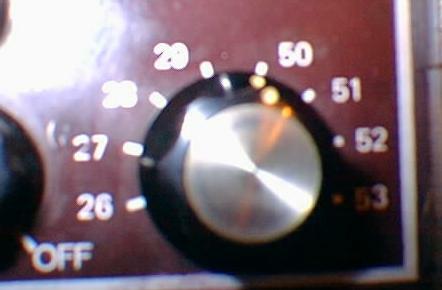 The radio offered the user very few controls, On/Off/Volume as one knob. USB/LSB/AM is another, labed U, L and A respectfully. The squelch could be set for AM or SSB or click set to off. The Mic gain knob was calibrated for use in AM and SSB modes. When in AM too much mic gain would easily overcome the carrier inserted and result in the receiving satation hearing an SSB transmission on audio peaks. A dial set which tuned a small value air capacitor to calibrate the VFO scale and an effective noise blanker in the form of a miniture toggle switch. 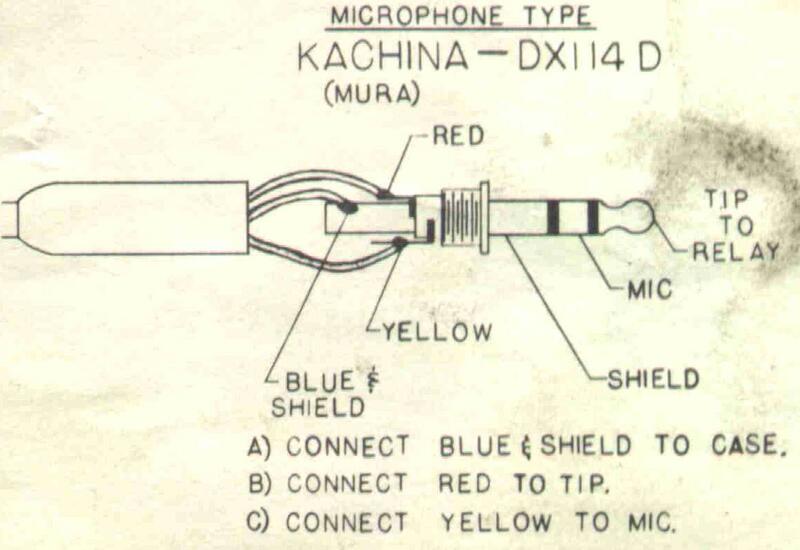 The microphone used a 3 ring (stero) 1/4 inch mic plug and the factory supplied microphone was a 600 ohm unit made by Mura. Below is the wiring for the radio. I have more information to scan and pictures to post on my Kachina when I get a chance. Should anyone have any questions or comments or own a Kachina 1 like mine please e-mail I would be very interested in hearing from you.